Simple. Classic. Hot. Sizzly. Get a bunch of 7’s and take your woman to the beach. Sizzling Hot Deluxe’s 5-reel and 5-payline machine is simple, but it’ll keep you glued to your chair. This classic slot from Novomatic is a 5-reel and 5-payline barnburner. 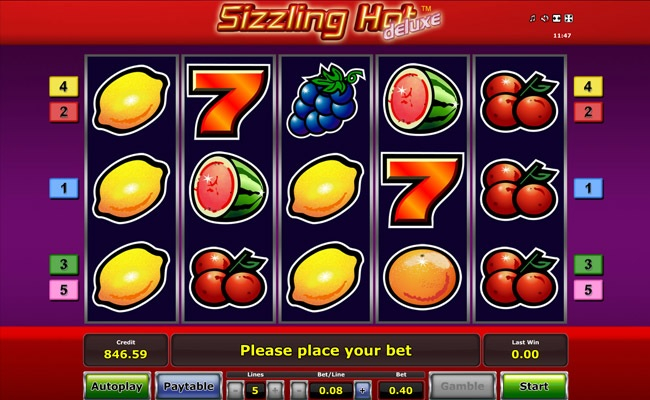 Sizzling Hot Deluxe is simple to play and as such, is a very popular choice among gamers. Along with the classic feel, the look of the symbols also invoke feelings of nostalgia. The beauty here is that the gameplay is pretty straightforward. All of your wins are going to come from matching symbols from left to right. The scatter symbol is the star symbol and, as such, you’ll get a win wherever that bad boy pops up on the reels. That said, you’ll be hoping for a bunch of 7’s to be showing up. Depending on your betting decisions, a heap of 7’s could make for a big win. Sometimes the simple things in life are what we should enjoy and appreciate. Sizzling Hot Deluxe is a great example of exactly that. Load up, match the symbols, and win big! Click here to get sizzling!